FOMC tomorrow. First major Bradley turn on the 16th March. Major Gann turn around the Equinox 21-23 March, which equates to the next top on my models. US Earnings Season begins again 10th April. Seasonal geomagnetism to peak in March-April and sunspots to ramp up again in the weeks ahead. That is an impressive spike. Now take a look how the models have tipped over on my Short Term and Medium Term models page. The message is clear – a market correction, or at least some volatility, is due. So I reiterate what I suggested at the end of last week: I expect either the markets to tip over and correct imminently, or for them to continue higher into 21-23 March, make a significant divergence from the models in doing so, and then correct. Essentially, upside was limited, the market was on borrowed time before it corrected. That said, the ‘borrowed’ time could last a couple of months, so I would want to see evidence of the market topping out from other sources, before shorting. So how do things look? Insider selling continues to be at an extreme. Short Yen positions are also at the extreme. The former suggests stocks should pull back, and the latter that money should pour into the safe haven Yen. But these two aside, we don’t see extremes. The consolidation in pro-risk has reset some of the indicators that had were toppy, suggesting more upside may be required to reach an overbought and overbullish reversal. If we look at the technical picture for the S&P500, we see it is flirting with its 2011 high, with potentially clear air above if it can break out, but also that it is within a rising wedge which would normally break to the downside. For my first scenario above of imminent correction, the index could potentially double top today with its high of the start of March, reversing at that horizontal resistance. For my second scenario of a push upwards into 21-23 March, the index could break out but within the wedge and overthrow to 1400 before a correction. Meanwhile, the US dollar has been rallying, which has taken the wind out of commodities to some extent. If the Fed is dovish tomorrow, extends Twist or similar, we could see a reversal, and precious metals gaining ground again. However, if they do nothing, the USD could maintain popularity. It remains in a very delicate long term position, and whilst I continue to believe that it will ultimately break to the downside in a mirror of the 1970s, we need a trigger for that to occur. I look at both precious metals and at mining stocks and see evidence for a big move up coming up, but not quite yet. Fed action tomorrow could provide a trigger, but failing that, a little more time looks needed. Treasury bonds continue to make a rounded top, yields a rounded bottom. If this is the prelude to a notable change in trend, then the Fed may have a reason to step in. OK, let me sum up with my favoured scenario: stocks push on higher into 21-23 March, making a big divergence from the models and reaching overbullish/overbought again. I think that would then make for a nice shorting opportunity, and a subsequent period of mean reversion. I suspect that because most indicators have eased off from being toppy we need to push up to hit extremes again. Those extremes, plus some big divergences, would make for a higher probability trade than right now. Equities: This is my shorter term model. I have modelled the path from the 8th onwards. Since my original projection was a low on the 23/11 up to the 8/3/12 – with a target of 1425 I have put the modelled price from the original target and the price reached by that date. This is in case the real price actually does revert to the original model. You end up with this band. Like you a rally from here would be divergent with my model and I get similar dates to you but from a slightly different angle. I the past when price has diverged from my model, where there is a timeframe, at about the halfway mark it then reverts. 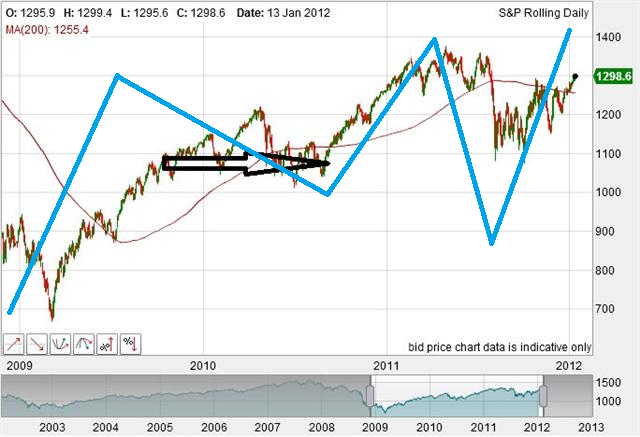 In this case if it was to rally up to the 19/20 of March then a retracement would be highly likely. Great post. One thing you did not mention is the shorter term Lunar Model. I believe that model would put buying pressure under the market right now, up until a day or two after the next New Moon. In other words, the Lunar Model suggests higher price this week and next week, with the next period of possibly lower stock prices beginning the week of March 26. Hi Pima, yes that’s a key part of my scenario of up into around 22 Mar, the next new moon. after seeing you work John I got curious about the Moon-Gold relationship. I plotted the New/Full phases on the continuous gold price chart XAU/USD. There is a pretty accurate relationship between New/Full phases and High/Low phases with an 8-10 days lag. This model signals a low for gold price tomorrow or monday although I rather hope we hit the low yesterday (early) as gold has taken a beating recently.